The image of Alyan Kurdi lying face down on the shores of Turkey haunted me for a very long time. The horror the only survivor of the Kurdi family- the father, must have gone through to see his family drown right in front of him is beyond my imagination. The refugee and immigrant crisis is complicated in so many ways. There is no one solution to it. Humanity is at stake and it is being tested today more than it was ever before. Im hoping and praying that humanity and peace triumph. The story that I am going to tell today is about 28 immigrants from Mexico who died in a plane crash in 1948, but unlike Alyan they died without an identity and without being given the dignity of their names till Tim Hernandez decided to do the right thing- give these 28 immigrants their identities. 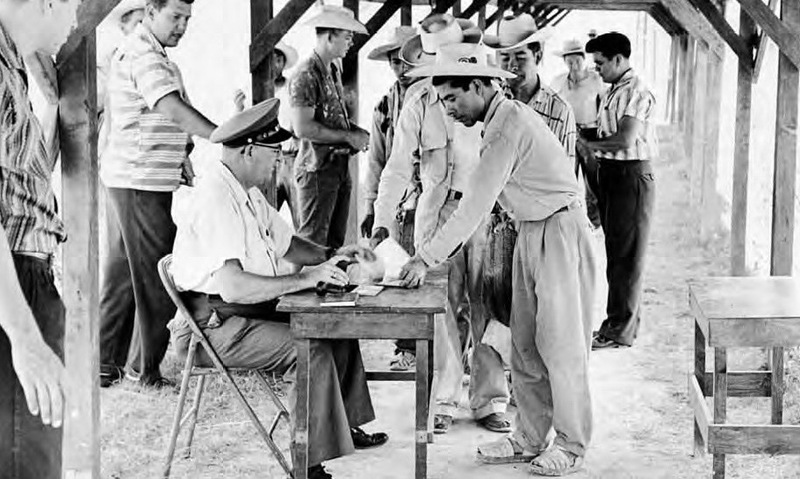 The Bracero Act- Mexican men registering before they start work. In the August of 1942 USA signed an agreement with Mexico called the Bracero( meaning labour in Spanish) Act. This act meant for the importation of temporary contract laborers from Mexico to the United States. At the start of the program, train loads of Mexican immigrants ready to work were sent over during the heart of WWII for the “emergency wartime agricultural and railroad importations”. 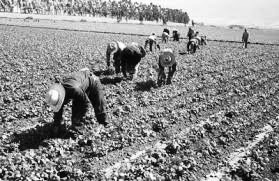 Shortages of food and other goods throughout the U.S caused chaos throughout the nation, leading to the Bracero program as a solution. On 28th January 1948, the aircraft Douglas DC3 took off from Oakland with 32 people on board. Four of them Americans and 28 Mexican immigrants were being flown to California to work on the farms there. After 45 mins since take off the left engine of the plane caught fire. The Douglas DC 3 was a World War 2 aircraft which was used for commercial flights towards the end of the war. It was prone to being heated up too quickly and had a bad record during the war. Frank Atkinson was flying this plane. He was a very celebrated World War 2 pilot who specialised in crash landing. He was once flying a plane that carried glass appliances, due to problems with the aircraft he had to crash land. The legend goes that he landed the flight so smoothly that not even one glass appliance was broken. Though this time around Frank wasn’t that lucky. His wife Bobbie Atkinson who was with him on the flight, two more Americans, 28 Mexicans and him were all going to die. After the flight caught fire it rolled for a few minutes and then hit the ground hard. The flight crashed in Las Gatos Canyon, in California’s San Joaquin valley. 100 prisoners were working on the farm where the plane crashed. There were 100 prisoners farming, when the flight crashed on their farms. They all went running towards the flight trying their best to find survivors. They found nothing but ashes. The flight had cut down all the telephone wires while falling down. Hence all telephone connections were lost that day. People and reporters heard about the news hours later on the radio. The reporters came to the sight much later and it made headline all over the country the next day. The news report mentioned names of the four Americans but not that of 28 Mexican immigrants. When Woody Guthrie read the news he was really angry. These Mexican men were people with names, how could the media just give them the label of ‘Immigrants’ and forget about it. Why were the names of the dead not mentioned? 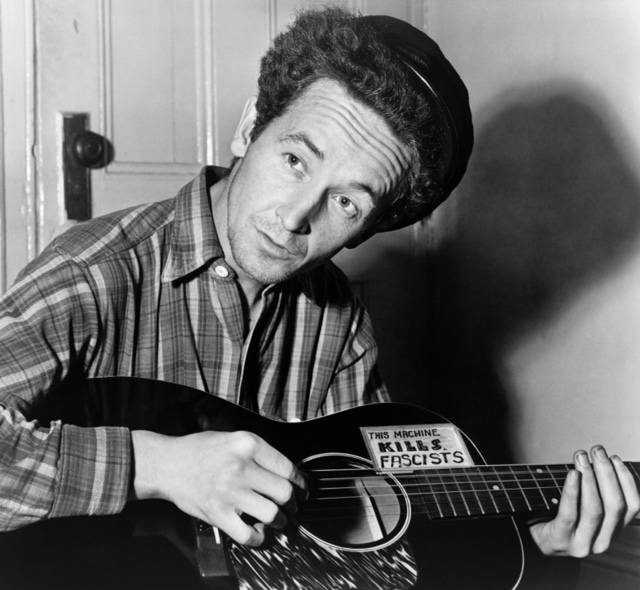 Woody Guthrie was a legendary folk artist and writer. He wrote a poem called “The Deportees”. The incident was forgotten. There was no television or internet then. Though the poem written by Woody was being circulated and spoken about amongst the student population. Thanks to the poem the story survived. 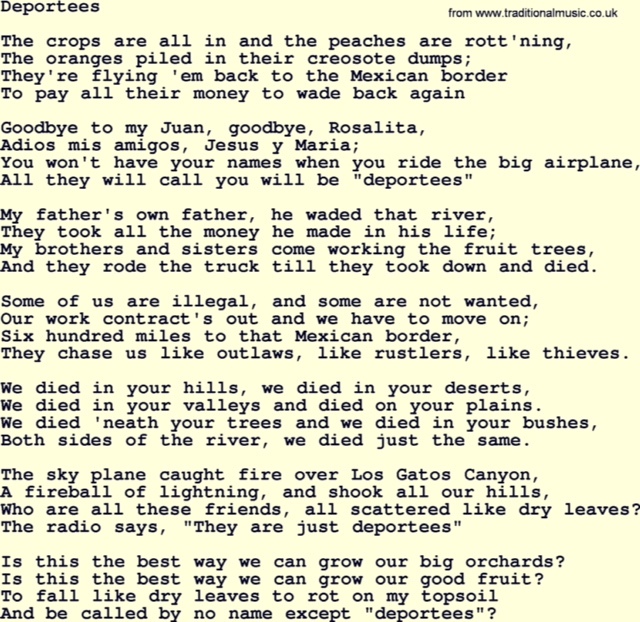 In 1957 Martin Hoffman a school-teacher and musician found Woody’s poem “The Deportees” and decided to give it a tune. He sang this song casually in a jamming session with his friends. One of his friends happened to be legendary singer Pete Seeger’s manager. When he told Pete about the song he immediately wanted to record it. “The Deportees ” became an instant hit. It was later recorded by the likes of Bob Dylan, Dolly Patron, Bruce Springsteen amongst others. Woody Guthrie! A folk artist and a legend. 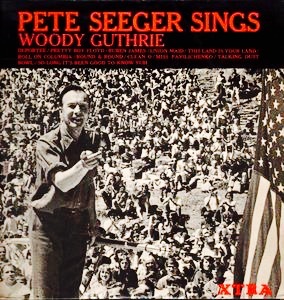 Pete Seeger sings, making it an instant hit. After all that success with the song there were still no names. It took 62 years after the crash when these Mexican immigrants were finally given the dignity of their names. In late 2010, Tim Z. Hernandez, a California poet and author while researching archives for his novel “Mañana Means Heaven,” came across the headline “100 Prisoners See An Airplane Fall From the Sky.” It was a story about the crash, and it changed the course of his career. He grew up in the farming communities of the San Joaquin Valley, and he connected with Guthrie’s poem because it echoed his own feelings of injustice for the 28 Mexican men and women who were left unnamed. But instead of simply lamenting the loss, Hernandez embarked on a nearly two-year quest for the long-forgotten names. With the help of Carlos Rascon, Director of Cemeteries for the Diocese of Fresno, he obtained lists from the Fresno Hall of Records and St. John’s Cathedral, where the original funeral mass was held. The lists matched, and the two worked to adjust misspellings of the Mexican names. One by one Hernandez researched the names through the Hall of Records, the Department of Labor and online details of their lives. 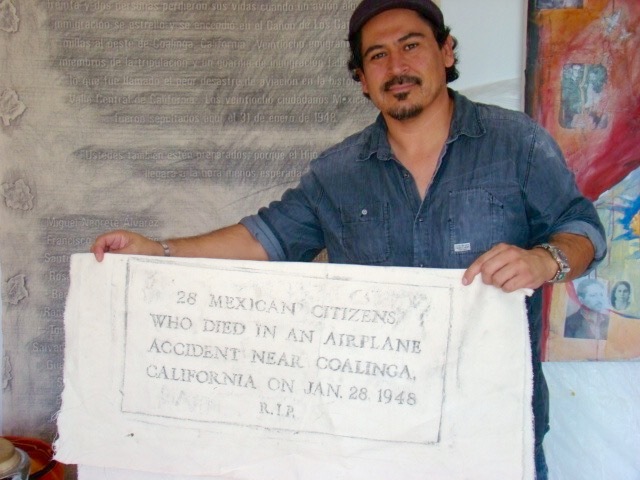 Tim Hernandez with the epitaph before he built a new headstone with the names on it. Tim didn’t want to stop here. He and his musician friend Lance Canales wanted to make a new headstone for these immigrants with their names on it. They started doing tours all over America with this story and singing the song ‘The Deportees”. It slowly gained momentum and people started pouring in with love and donations. They raised ten thousand dollars through these tours and finally were able to raise the tombstone. It took 62 years but Tim and Lance gave these men their dignity and identity back. Today this site has become a historical site in Fresno. The life you live comes down to choice. Do you choose the right over the wrong, the difficult over the easy? Do you choose to fight for people who can’t fight for themselves? Do you choose to name the dead or just label them immigrants? As long as we have a choice, humanity has a chance. Tim Hernandez made his!